A variety of peach, nectarines (Prunus persica var. nucipersica) are juicy, sweet and soft fruit with just as many wonderful health benefits as peaches. As shown by research, nectarines are just as nutritious as peaches and boast a similar vitamin, mineral and antioxidant content. For this reason, those of you who just can’t get pass by the fuzz of the original can easily substitute it with the fuzzless nectarine cultivar. Nectarines are a good source of several essential nutrients, namely niacin, vitamins A and C, vitamin E, copper, iron and phosphorus, as well as trace amounts of other B vitamins and dietary minerals. Major antioxidant compounds found in nectarines are chlorogenic acid, neochlorogenic acid, catechins, epicatechins, ellagic acid, gallic acid and anthocyanins, all of which protect cells and DNA against free radical damage causing abnormal, potentially cancerous mutations. What is the difference between nectarines and peaches? Although they are believed to be two distinct fruit, nectarines and peaches are actually two varieties of the same species. While peaches are fuzzy, nectarines have a smooth, fuzz-less skin, hence the confusion. The reason for this is because a gene responsible for the fuzziness in peaches remains dormant in nectarines, hence their fine skin. What do nectarines look like? 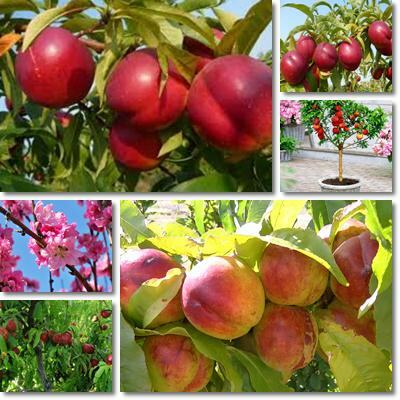 Both nectarine and peach tree, branches, flowers and fruit look very much like one another, which is natural considering they are the same species. However, nectarines are usually a bit smaller than peaches and, most important, lack the trademark fuzz. As a result of not having fuzz, their thin skin is smooth. Nectarine skin is actually golden-yellow but has large patches of red or is tinged with orange or green. Ripe fruit may show tiny brown spots similar to those on pears, for example. Depending on the variety, flesh color may range from golden-yellow to white. What do nectarines taste like? Nectarines are juicy and sweet, with a crisp, firm texture. Similar to peaches, they have a single, large, brown, ribbed seed called a stone. While in some varieties called freestone the seed can be easily removed, others (clingstone) have it embeded in the flesh and it is harder to remove. What do nectarines taste like? Nectarines have a soft, but firm succulent flesh and a particularly sweet flavor, more pronounced than that of peaches. They are often eaten fresh, along with the skin, though some people prefer to discard it. When choosing nectarines, do not let yourselves be fooled by how red they are. Redness is a trait that depends mostly on cultivar. Look for a golden or yellow undertone and avoid fruit that are too firm at touch, have green patches instead of yellow ones or do not have a sweet, fragrant smell. How to eat nectarines? Nectarines can be eaten whole, skin and flesh. However, some people prefer to either peel them or blach them quickly, the peel off their skin. Nutritionally speaking, it is best to consumed the fruit along with its skin. Nectarine skin is rich in anthocyanin pigments with excellent antioxidant properties. 1) Rich source of antioxidants. Anthocyanins from the strongly pigmented skin, chlorogenic acid, neochlorogenic acid, catechins, epicatechins, ellagic acid, gallic acid as well as several others contribute to the antioxidant properties of nectarines. Antioxidants act at cell level and protect against free radical damage disrupting normal cell activity. 2) Anticancer properties. While they may not be as potent as cruciferous vegetables (broccoli, cauliflower etc. ), nectarines contain a variety of potent antioxidants which help prevent damage that may alter normal cell activity, causing healthy cells to turn into cancerous ones. Also, many antioxidants boast excellent anti-inflammatory properties as well. According to research, high inflammation levels represent a risk factor for chronic disease (cancer, diabetes, cardiovascular disease), hence the importance of having a predominantly natural diet, rich in fresh fruit and vegetables, nuts, seeds, whole grains and dried fruit. 3) Good source of vitamins A, C and E. Vitamin A is supportive of eye health and strong immunity, ensuring good vision and healthy mucous membranes (nose, mouth, throat, stomach mucosas and lungs). Vitamin C is an incredible natural antioxidant, anti-inflammatory and antibacterial, essential for keeping in good health. Vitamin E contributes to beautiful skin and exhibits antioxidant properties. B vitamins (niacin, pantothenic acid and thiamine) are also found in small amounts in nectarines and contribute to good digestion and improved energy levels. 4) Tonic properties. Copper, phosphorus, iron, manganase and magnesium can all be found in small amounts in nectarines. And considering that the fruit is particularly sweet, juicy and flavorful, we will most likely eat more than 100 g once we get started and thus enjoy higher intakes of the nutrients. Dietary minerals exert excellent tonic properties and help invigorate us and boost our energy levels. 5) Anti-obesity and anti-diabetic properties. According to research (Peaches, plums, nectarines give obesity, diabetes slim chance), stone fruits such as peaches, nectarines and plums may help reduce diabetes and obesity risks as well as fight against metabolic syndrome. Polyphenols in stone fruits are believed to be responsible for such health effects. 6) Good source of dietary fiber and low in calories. With 1.7 g of dietary fiber/100 g of fruit and only 44 kcal, nectarines are an ideal sweet snack. Not only do they help rehydrate us, but they do so in a delicious, figure-friendly manner. In addition to helping maintain a steady weight, the dietary fiber in nectarines also helps reduce the amount of fats our intestines absorb, indirectly contributing to lower cholesterol levels.